Most craft beer fans know that Goose Island is now owned by Anheuser-Busch InBev but few know the real story. Get the details in Barrel-Aged Stout and Selling Out: Goose Island, Anheuser-Busch, and How Craft Beer Became Big Business by Josh Noel. While the basic story of the sale of Goose Island is known by most, it would seem the majority of beer fans only know what they’ve seen in headlines or short news articles. Author Josh Noel goes far deeper, sharing the in-depth tale and details of Goose from founding to final sale. 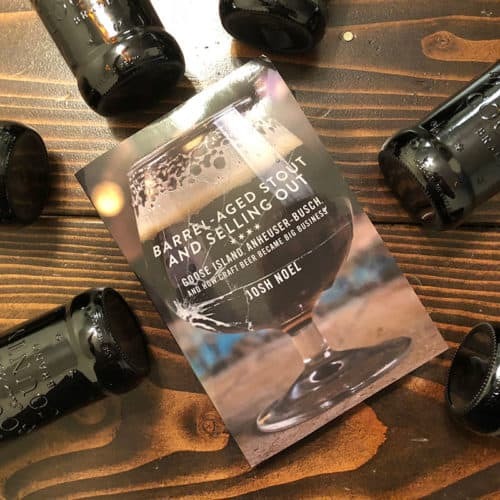 Barrel-Aged Stout and Selling Out is a detailed account of the timeline from start to acquisition. Goose Island started at a time when the outlook for craft brewers in the US wasn’t as bright as it is today. They took a chance in a rundown Chicago neighborhood and were able to build one of the best known breweries in the country. That story alone is well worth the read, with details gained from those that helped to build the brand from the early day, providing an inside look. While most seem to believe the buyout was a heavy-handed takeover by Anheuser-Busch, the truth is that Goose Island was a willing participant. Barrel-Aged Stout and Selling Out shares the details of how they first entered into an agreement in order to increase distribution and capacity. Only later on did they agree to sell in their entirety, when again scale became an issue. The book reads easily and allows you to feel as if you’re privy to exclusive information about the internal workings of Goose Island and the deal that was made to make them part of the largest beer company in the world. The history of the craft industry and the players involved is an interesting one. From how they started to where they are today, Barrel-Aged Stout and Selling Out is a great look at one of the largest craft brewers in the country. It’s recommended reading for anyone who wants to know more about how the craft beer industry has grown and what we’re likely to see more of, as buyouts become more common. Grab a copy of Barrel-Aged Stout and Selling Out: Goose Island, Anheuser-Busch, and How Craft Beer Became Big Business from Amazon now and up your industry knowledge.